“POSSESSING THIS GIFT OF CHOICE, those in Noah’s world all made the same decision. They rejected the Creator – so much that this generation was essentially devoid of God. Like He wasn’t there. They had unanimously voted God off the island, eliminating Him completely from earth’s equation. In the absence of a more complete revelation about God, which would come later through Moses, the prophets, and Jesus, Noah’s generation still had knowledge of the Creator. But there’s another convincing evidence regarding this knowledge of God. This one doesn’t require looking outwardly at the stars or creation. We are told that the Creator has embedded this knowledge inside us as well, without the need for external testimony. Romans 2:14-15 says, ‘humankind instinctively knows the difference between right and wrong because this knowledge is written in their hearts through conscience.’ It comes standard, like a computer’s basic operating system, preprogrammed within us. This elementary knowledge of God is called general revelation, and in spite of our fallen, sinful nature, it exists in all of us. Paul says those who deny its reality (about God and themselves) ‘suppress the truth in unrighteousness’ (Romans 1:18). In other words, they choose to ignore it. When people reach the point where they pursue self-pleasure as the highest form of existence, that’s when God releases the parking brake and begins letting go. Treated as nonexistent, distant, irrelevant, or intrusive, God now graciously bows out from the person’s life and officially gives them over to their own desires,” says Kinley. 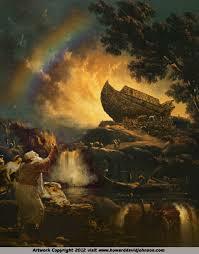 As it was in Noah’s day, so it is in ours. Regrettably, some of us are on that same path of pathos and regret. Saying it isn’t so doesn’t make it go away. God is merciful, but forgiveness isn’t a given, and it isn’t automatic….it follows repentance. And if you are reading this, thank God, there’s still a window of opportunity for you. Wonderful explanation of God within us. God is a Gentleman who will not intrude in our lives without permission. Your description of today & what is going on even in the White House is spot on. Thank you Janet for your writing! The days grow darker, but His return draws nearer!!! Thanks for your faithfulness, my sister!